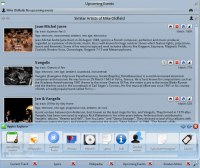 '''Amarok''' is a free, cross-platform, versatile, powerful and feature-rich music player. It allows easy collection management, automatically retrieves information and covers, and has built-in compatibility with services such as '''Jamendo''', '''Last.fm''', '''Magnatune''', and '''Librivox'''. It also can be completely customized, so users can modify its look and layout so it fits their needs. The current stable release is version 2.8. If you are new to '''Amarok''', you might want to have a look at the [[Special:myLanguage/Amarok/QuickStartGuide|Amarok Quick Start Guide]]. If you are new to '''Amarok''', you might want to have a look at the [[Special:myLanguage/Amarok/QuickStartGuide|Amarok Quick Start Guide]] or browse the complete [[Special:myLanguage/Amarok/Manual|Amarok Handbook]]. 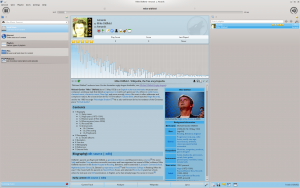 '''Amarok''' sports a three-pane interface by default. ||The ''Media Sources pane'' on the left is the place where you access your local collection as well as other services: <menuchoice>Local Music</menuchoice> on top, which is the primary interface to your local collection and connected media such as mp3 players and CDs. There is a section for all <menuchoice>Internet Services</menuchoice> that you have enabled. Here, you can browse listings of radio stations and podcasts; listen/subscribe to them, interact with your [http://www.last.fm last.fm] account, purchase music from online stores such as '''Magnatune''' and download independent artists' music from '''Jamendo''' and more. The <menuchoice>Playlists</menuchoice> section allows you to create and manage ''Dynamic Playlists'', access your ''Saved Playlists'' as well as the ''Automatic Playlist Generator''. The <menuchoice>Files</menuchoice> section displays an integrated file browser and the <menuchoice>Podcasts</menuchoice> section will let you access your podcast subscriptions. 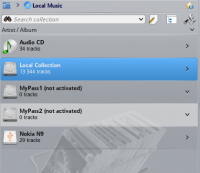 ||The ''Media Sources pane'' on the left is the place where you access your local collection as well as other services: <menuchoice>Local Music</menuchoice> on top, which is the primary interface to your local collection and connected media such as mp3 players and CDs. <br />There is a section for all <menuchoice>Internet Services</menuchoice> that you have enabled. Here, you can browse listings of radio stations and podcasts; listen/subscribe to them, interact with your [http://www.last.fm last.fm] account, purchase music from online stores such as '''Magnatune''' and download independent artists' music from '''Jamendo''' and more. <br /> The <menuchoice>Playlists</menuchoice> section allows you to create and manage ''Dynamic Playlists'', access your ''Saved Playlists'' as well as the ''Automatic Playlist Generator''. <br />The <menuchoice>Files</menuchoice> section displays an integrated file browser and the <menuchoice>Podcasts</menuchoice> section will let you access your podcast subscriptions. ||This is where all the information is displayed. The central pane contains 3 applets that dynamically change to display context information about the track that is currently playing. You can see the rating, score and play count of the ''Current Track'' applet or the last played tracks if nothing is playing, the ''Lyrics'' of the song and the ''[http://www.wikipedia.org Wikipedia]'' page on the artist. More applets can be added, removed or rearranged using the settings icon on the ''Applet Bar'' at the bottom of the pane. ||This is where all the information is displayed. The central pane contains applets that dynamically change to display context information about the track that is currently playing. <br />You can see the rating, score and play count of the ''Current Track'' applet or the last played tracks if nothing is playing, the ''Lyrics'' of the song and the ''[http://www.wikipedia.org Wikipedia]'' page on the artist. <br />More applets can be added, removed or rearranged using the settings icon on the ''Applet Bar'' at the bottom of the pane. ||'''Amarok''' has the most configurable playlist of any music player in existence. It puts the power in your hands to shape the playlist any way you see fit. To start you off, there are three pre-configured playlist layouts that you can use as starting points to create the layout that fits your flow the best. You can generate playlist dynamically with various bias or use the Automatic Playlist Generator, shuffle, play at random or repeat, queue tracks and save the existing playlists for later use. ||'''Amarok''' has the most configurable playlist of any music player in existence. It puts the power in your hands to shape the playlist any way you see fit. <br />To start you off, there are three pre-configured playlist layouts that you can use as starting points to create the layout that fits your flow the best. You can generate playlist dynamically with various bias or use the Automatic Playlist Generator, shuffle, play at random or repeat, queue tracks and save the existing playlists for later use. |[[Image:Amarokfull.png|thumb|300px]]||'''Amarok''' can support most popular formats for music files. The actual list of formats is dependent on the codecs and audio backend in use on your system. There's also support for traditional playlists &mdash; you can create, save and load all the playlists you want. |[[Image:Amarok_2.8_DefaultBlocks.png|thumb|300px]]||'''Amarok''' can support most popular formats for music files. <br />The actual list of formats depends on the codecs installed and the Phonon audio backend in use on your system. <br />There is also support for traditional playlists &mdash; you can create, save and load all the playlists you want. |[[Image:Amarok2.1ipod.png|thumb|300px]]||Amarok offers support for a great variety of Media devices such as '''iPods''', [http://en.wikipedia.org/wiki/Media_Transfer_Protocol '''MTP'''] and [http://en.wikipedia.org/wiki/USB_mass_storage_device_class '''UMS'''] devices. 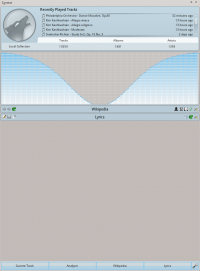 |[[Image:DeviceSupport2.6.png|thumb|200px]]||Amarok offers support for a great variety of Media devices such as '''iPods''', [http://en.wikipedia.org/wiki/Media_Transfer_Protocol '''MTP'''] and [http://en.wikipedia.org/wiki/USB_mass_storage_device_class '''UMS'''] devices. The button <menuchoice>Merge View</menuchoice> at the top of the collection lets you merge collections. This means songs from your local collection, audio CD, mp3-player and so on will be shown in one unified collection. It is a toggle switch so you can easily revert to showing the separate sources. |[[Image:Context-applets-amarok.png|thumb|300px]]||The ''Context view'', the centerpiece attraction in '''Amarok''', can automatically fetch contextual information about the currently playing song (such as album art, lyrics or [http://www.wikipedia.org Wikipedia] information) from the Internet and display them. This is one of the unique features of the '''Amarok''' series. |[[Image:ContextView2.6.png|thumb|200px]]||The ''Context view'', the centerpiece attraction in '''Amarok''', can automatically fetch contextual information about the currently playing song (such as album art, lyrics or [http://www.wikipedia.org Wikipedia] information) from the Internet and display them. This is one of the unique features of the '''Amarok''' series. |[[Image:Amarok - Internet Services.png|thumb|200px]]||Amarok opens the gateway to a rich multimedia experience on the Internet. |[[Image:InternetServices2.6.png|thumb|200px]]||Amarok opens the gateway to a rich multimedia experience on the Internet. * Sporting interfaces to services such as ''Ampache music servers'' and ''mp3tunes lockers'', it allows you to listen to your music from anywhere in the world. * You can sample and buy music from '''Magnatune'''. * Using the '''Jamendo''' service, you can listen to and download music from independent artists who can be supported by your donations. 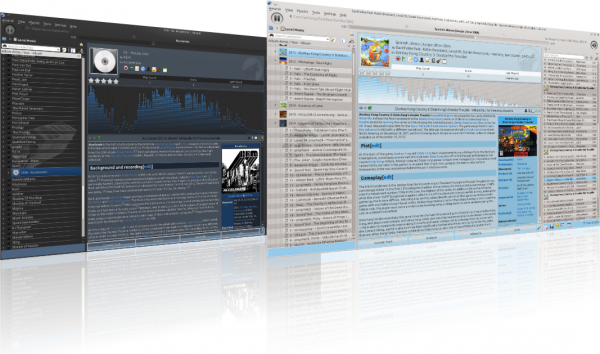 * With integrated '''[http://www.last.fm last.fm]''' functionality, you can ''scrobble'' your tracks, use '''[http://www.last.fm last.fm]''' features like statistics, charts and subscribers can listen to radio streams customized to your music taste &mdash; all from Amarok. * Depending on your region, you may have access to the Amazon MP3 music store. And that is just the beginning &mdash; you can add even more Internet services using the <menuchoice>Script Manager</menuchoice>. |[[Image:Amarok2.1scriptmanager.png|thumb|300px]]||Scripts are add-ons that allow you to extend '''Amarok'''&rsquo;s functionality in innovative ways. Using the <menuchoice>Script Manager</menuchoice>, you can manage these scripts in that it allows you to install/remove or enable/disable scripts you already have. You can also use the <menuchoice>Get More Scripts</menuchoice> feature to download new scripts submitted by other users. |[[Image:Amarok_2.8_ConfigurationDialogScripts.png|thumb|200px]]||Scripts are add-ons that allow you to extend '''Amarok'''&rsquo;s functionality in innovative ways. You use the <menuchoice>Settings -> Configure Amarok -> Scripts </menuchoice> option to open the '''Amarok Add-on Installer''' window. |[[Image:Amarok2.1covermanager.png|thumb|300px]]||You can browse through your music collection using the nifty <menuchoice>Cover Manager</menuchoice> that displays the album art, download covers from various sources or let Amarok check automatically for covers in the internet. |[[Image:CoverManager2.6.png|thumb|200px]]||You can browse through your music collection using the nifty <menuchoice>Cover Manager</menuchoice> that displays the album art, download covers from various sources or let Amarok check automatically for covers in the internet. |[[Image:Amarok2.1rating.png|thumb|300px]]||You can show your love for the songs by rating them. '''Amarok''' supports '''&frac12;&sdot;&#10025;''' ratings, too. In addition, '''Amarok''' can calculate a score (a sort of guessed rating) depending on metrics such as how often you listen to or skip a song. |[[Image:RatinScoring2.6.png|thumb|200px]]||You can show your love for the songs by rating them. '''Amarok''' supports '''&frac12;&sdot;&#10025;''' ratings, too. In addition, '''Amarok''' can calculate a score (a sort of guessed rating) depending on metrics such as how often you listen to or skip a song. |[[Image:PUD-amarok.png|thumb|300px]]||This is an innovative interface that offers contextual options (such as the ones you see in a ''right-click menu'') that you can "drop" a song into. Grab a track and see the Pop-Up Dropper appear in the context view pane! |[[Image:Amarok_2.8_PopUpDropperAdd.png|thumb|200px]]||This is an innovative interface that offers contextual options (such as the ones you see in a ''right-click menu'') that you can "drop" a song into. Grab a track and see the Pop-Up Dropper appear in the context view pane! |[[Image:Amarok2.1pleditor.png|thumb|300px]]||The currently loaded playlist is highly configurable and can show information about the songs in any form you like. If you are used to the <menuchoice>Spreadsheet View</menuchoice> found in Amarok&nbsp;1.x series and other music players, you can have that, too! The <menuchoice>Playlist View</menuchoice> also allows you to save or export the current playlist. |[[Image:Amarok_2.8_PlaylistLayoutEditor.png|thumb|200px]]||The currently loaded playlist is highly configurable and can show information about the songs in any form you like. If you are used to the <menuchoice>Spreadsheet View</menuchoice> found in Amarok&nbsp;1.x series and other music players, you can have that, too! The <menuchoice>Playlist View</menuchoice> also allows you to save or export the current playlist. |[[Image:Amarok2.1dynamicplaylist.png|thumb|200px|left]]||Amarok allows you to create weighted random playlists that adhere to various criteria exactly (<menuchoice>Proportional bias</menuchoice>) or approximately (<menuchoice>Fuzzy bias</menuchoice>). For example, you can create a playlist that will be randomly populated by songs that are rated more than 3 stars and are approximately from around the year 1967! 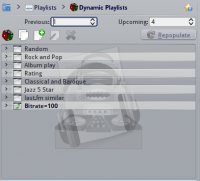 |[[Image:Amarok2.6dynamicplaylist.png|thumb|200px|left]]||Amarok allows you to create weighted random playlists that adhere to various criteria exactly or approximately. For example, you can create a playlist that will be randomly populated by songs that are rated more than 3 stars and are approximately from around the year 1967! where '''''folder''''' is the path to the folder that has the problem. Then select <menuchoice>Settings -> Configure Amarok</menuchoice> in Amarok main window menu, and open <menuchoice>Collection -> Rescan Collection</menuchoice> page. Your folder should be visible again now. * You may find an answer in the [[Special:myLanguage/Amarok/Manual/Various/FAQ|FAQ's]] page. * For more difficult questions have a look at the [[Special:myLanguage/Amarok/Manual/Various/TroubleshootingAndCommonProblems|Troubleshooting]] page. * For support, please have a look at [http://forum.kde.org/viewforum.php?f=115 the Amarok Forum]. * You can also get direct support in the #amarok channel on the irc.freenode.net network Please ask your question and be patient, as soon as somebody is around who can help you will get an answer. There also are localized channels, please have a look at #amarok.de for questions in German and #amarok.fr for questions in French as well as #amarok.es for questions in Spanish.